At least one tornado was quickly confirmed by the National Weather Service from Monday’s severe weather. Cleanup continues across parts of New England after a powerful storm caused major damage and knocked out power to thousands on Monday. 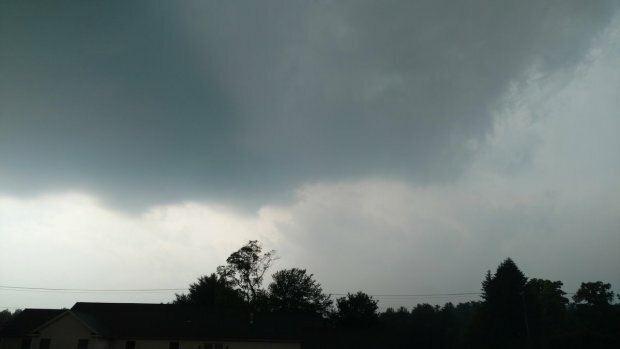 Tornado warnings were issued on three separate occasions for parts of Massachusetts and New Hampshire. Hundreds of lightning strikes were reported across the region, and what looked like funnel clouds were spotted in several areas. "I look out my window. Winds start picking up. Visibility drops to five feet at most. It was just completely gray. Wind starts howling," recalled Brendan Ryan. Trees and wires were reported down in many areas across Massachusetts, from the western part of the state to the North Shore. Cleanup is underway across parts of New England after a powerful storm caused major damage and knocked out power to thousands on Monday. One tree came crashing down in Haverhill while a couple was in front of their home, creating a scary moment for the elderly couple. While they are OK, their home is not. The tree caused extensive damage, crashing through the ceiling and down to the kitchen floor. George Brown, a friend of the couple's, shot cell phone video from the couple's roof showing the large tree inside the house. Brown said the couple has been there 80 years and they don't want to leave their home. The couple was too upset to go on camera. Haverhill firefighters inspected the damage, walking around with flashlights on Monday night. The American Red Cross was on scene to assist the couple. They planned to stay with neighbors while they figured out what to do next. There were also a number of trees and wires down in Westford, where Old Lowell Road was blocked to traffic late Monday night. Crews said they will be working around the clock to clear the roadway. Tree branches also littered Roberts Road, where a tree limb could be seen lying on power lines. Police blocked the area and many other roads throughout Westford that were similarly damaged. 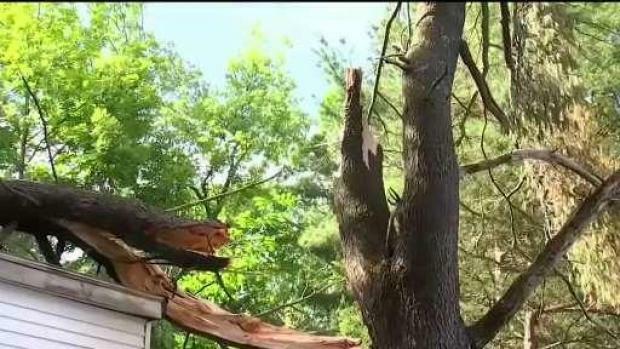 A falling tree nearly split a home on South Chelmsford in half. Crews said fortunately no one was hurt. About 100 people were displaced when the roof of their apartment building in Springfield partially collapsed during a heavy thunderstorm. The city's code enforcement division condemned the buildign and cut the power. The landlord and Red Cross were workign to find the residents temporary shelter. In Methuen, heavy rain and strong winds knocked down a tree, leaving a messy tangle of branches, leaves and power lines. 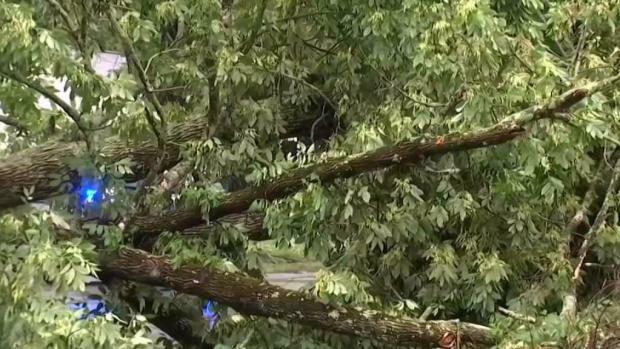 Police said the tree came crashing down onto a car while a woman was inside. Luckily, the woman was able to get herself out and wasn't badly hurt. The heavy winds and rains also knocked down trees and power lines in Manchester and Keene, New Hampshire and in western and southern Maine. 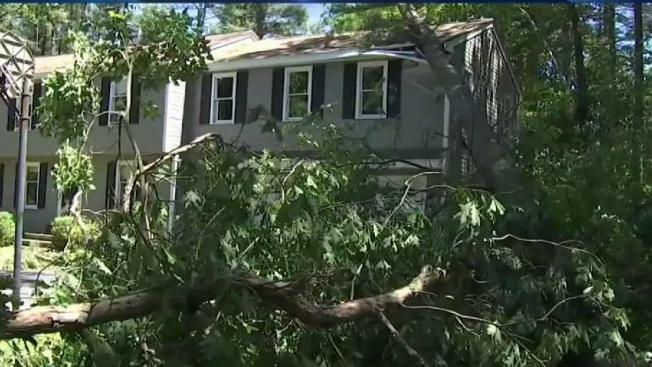 NBC10 Boston tracked the damage from Monday's severe storm, which included flooding, power outages and downed trees. Meteorologist Pete Bouchard has the latest on the forecast, while Eli Rosenberg is in Haverhill where an old tree crashed through a home, Audrey Asistio is in Westford where crews are working to clear the roads of downed trees and power lines, and Frank Holland is in Methuen where a tree came crashing down on a car while a woman was inside. Keene's city manager said about six to eight homes were damaged. Goffstown, New Hampshire saw a good amount of damage as well. Police were forced to shut down Saint Anselm Street after a power pole began leaning and got too close to a home. On Interstate 89 north, a large downed tree blocked two lanes, causing a traffic backup. The strong winds also ripped down a barn in Waitsfield, Vermont. By Tuesday morning, there were still some scattered outages, with more than 11,000 customers without power in New Hampshire and about 1,100 customers in Massachusetts. Those numbers were down from the more than 100,000 people who had reported power outages in the two states on Monday night.